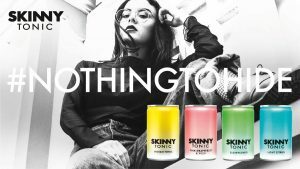 ignis, the creative agency, announced that its partnership with zero sugar drinks start up Halo Drinks has culminated in the launch of Skinny Tonic in Asda stores UK-wide. Made using high grade stevia the premium tonic water contains zero sugar, zero calories and no artificial ingredients. Skinny Tonic is also the first premium tonic water brand to launch exclusively in cans, a significantly more environmentally friendly approach than their bottle counterparts. ignis as well as building the positioning and packaging design for the brand has negotiated the first brand partnership for Survival International. Survival International is a charity working with indigenous tribes, particularly in the areas from where the stevia plants are naturally grown. As a result of the deal Survival will receive a proportion of all profits made by Halo Drinks. Skinny Tonic is available across Asda stores from 18th March 2019 onwards.